With warm, sunlit seas and tropical islands of sugar-white beaches, with overhanging palms, it’s easy to see why the Caribbean is considered as one of the greatest yacht cruising grounds on earth. Yet there’s one element that can enhance a Caribbean yacht charter further still: a quality selection of unusual watertoys carried by a luxurious superyacht. Whether you’re a fanatic of sports fishing, scuba diving, jet-skiing, or just playing on the water in the sunshine, here is a selection of the best toys on the yacht market, as well as some of the Caribbean charter yachts that carry them. There’s nothing quite like the sight of a stunning superyacht at anchor with a giant inflatable slide snaking from its top deck down to the sparkling Caribbean sea. Imagine emerging from your luxurious stateroom in the morning and hurling yourself down the slide before breakfast on deck, or waking yourself up from a dreamy afternoon nap with a burst of adrenaline as you launch down the slide into the warm, crystalline water. For fun on the water, it’s hard to beat the superyacht waterslide; they’re a massive crowd pleaser for all charterers – of any age. Which yacht? 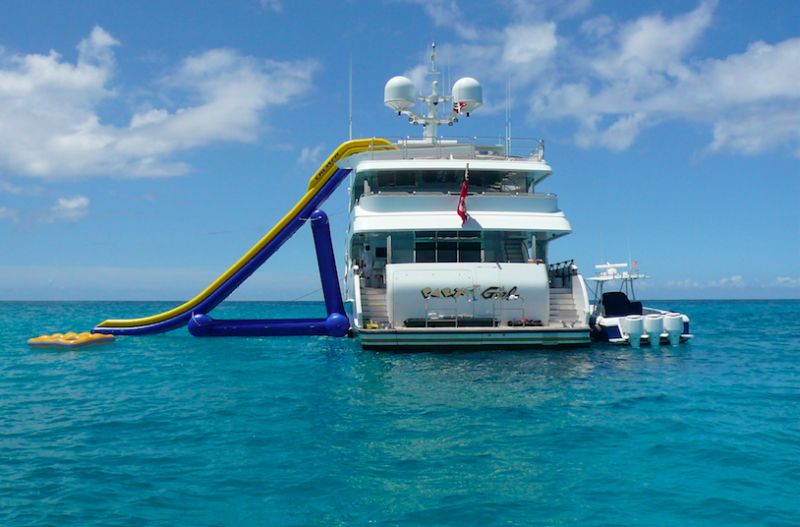 If booking a charter yacht with a waterslide for the Caribbean winter season, the 44.5m M/Y PARTY GIRL is an exceptional choice. Accommodating up to 12 guests in six stunning staterooms, M/Y PARTY GIRL indulges its guests with elegant décor, a sun deck Jacuzzi and an elevator, not to mention its fantastic waterslide. M/Y PARTY GIRL also carries an amazing selection of other water toys for yacht charter fun, including two waverunners, water-skis, a knee board and wake board, 12 sets of snorkelling gear, inflatable towables, and an array of beach games and shelters. M/Y PARTY GIRL is available for charter in the Bahamas and the Caribbean from USD 169,000 per week. For keen anglers and divers, there can be no mistaking the appeal of a yacht with a sportfisher chase boat and a Brownie’s third lung. Step off your superyacht onto a large sportfisher and speed off to find the best game fishing or remote dive site. Sportfishing yachts are fitted out to luxurious standard, so you can enjoy a sumptuous lunch onboard between bouts of fishing or diving. A Brownie’s Third Lung enables divers to stay submerged for extended periods of time – perfect for exploring the abundant sea life of the Caribbean. Which yacht? To book a Caribbean charter yacht with a sportfisher chase boat and a Brownie’s Third Lung, look no further than M/Y WHEELS, a 50m Trinity superyacht that comes with its own 24.40m Merrit sportfisher, which is aptly named M/Y REEL WHEELS. M/Y WHEELS is an extremely popular charter yacht with superb outdoor spaces and a luxurious interior. She accommodates up to 12 guests in six spacious staterooms, with an additional double stateroom on the sportfisher. This superyacht comes with a treasure chest of watertoys, including a jet-ski, Waverunners, Seabobs, wake boards and water-skis, paddle boards, snorkelling and fishing gear, 12 x scuba sets and plenty of towables. M/Y WHEELS is available for charter in Florida and the Bahamas for a weekly rate of USD 200,000/week – inclusive of M/Y REEL WHEELS at a value of USD 30,000. 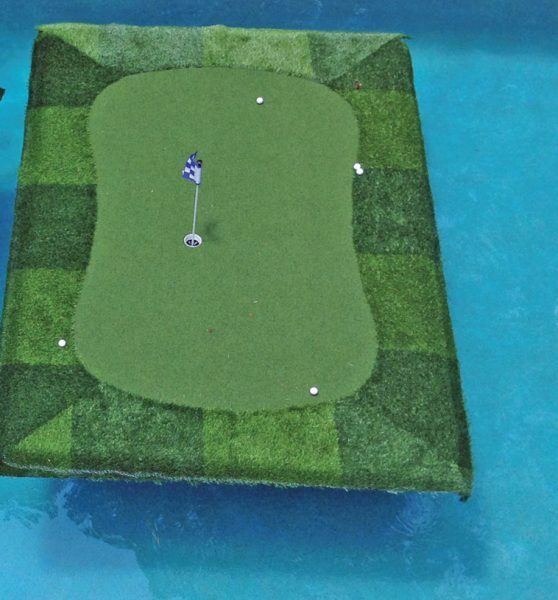 Golfing enthusiasts may regret leaving their passion behind when embarking on a yacht charter, but some yachts now carry floating golf greens and balls. This unusual, fun watertoy means a diversification of the conventional yachting experience. It is also now possible to purchase biodegradable golf balls that dissolve in the water, offering an environmentally friendly means of practising your swing. Which yacht? If you’d like to play a game of golf while at sea, then the charter yacht for you this Caribbean winter season may well be the 57m Trinity yacht, M/Y LADY SARA. This opulent yacht accommodates up to 12 guests in six magnificent staterooms, with a decadent interior décor of Italian marble, Lalique glass panels and silk carpet. There’s also a helipad and Jacuzzi on board, and, as well as a floating golf green, the yacht carries a jet-ski, Waverunners, Seabobs, kayak, paddle boards, wake board, knee board, water-skis, inflatables and snorkelling and fishing gear for lots of fun in the sun. M/Y LADY SARA is available for charter in the Bahamas and the Caribbean for USD 250,000/week. To find out more about the listed charter yachts for a Caribbean watersport adventure, contact Fraser Yachts, the world’s leading full-service yachting company.